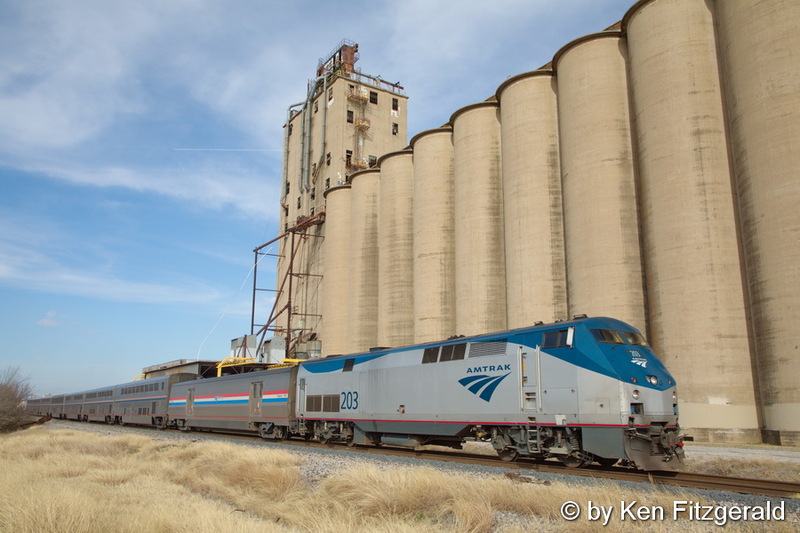 Today Friday February 9th was the last of the three-day diversion of Amtrak 21 and 22 over the UP instead of the BNSF between Temple and Fort Worth due to a tie replacement project. 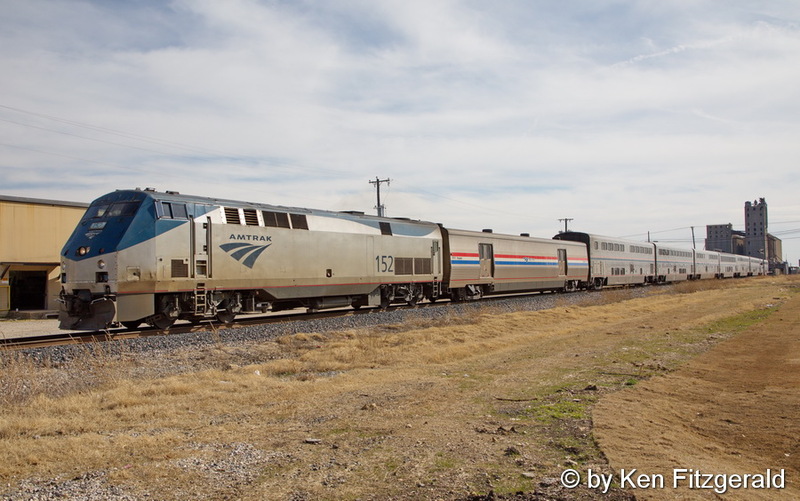 I picked up Dave Steckler with the intention of trying to catch both trains together on the UP in Fort Worth in the same frame since I had caught them separately in more rural settings the past two days. Wednesday and Thursday the trains had met at Wrenn Siding, but today train 21 was running later than before and so while it was sitting at the Fort Worth ITC the UP dispatcher brought train 22 on into town and up to the station. Rather than duplicate a shot that can be taken on many other normal days, Dave and I elected to catch number 22 in south Fort Worth at the Bewick Street crossing where the side light was more favorable at 2:28 pm and we had greater open space in the foreground than in other spots. The abandoned grain elevator in the background further south at the corner of West Dickson and Alice Streets called out to us as a potential background for the better-lit passage of train 21. At 3:18 pm just before clouds started rolling in we recorded the last UP diversion of this week. Tomorrow it is back to the the regular route for a few days and then we will cease to see trains 21 and 22 in Fort Worth at all for what is predicted to be a month’s time as the BNSF tie replacement project continues on south from Fort Worth to Temple. The trains will detour over the UP through east Texas with train 21 running Big Sandy to Tyler to Corsicana to Hearne to Taylor while Train 22 will run Taylor to Hearne to Palestine to Longview. Maybe this year I can get over there for a few more diversion photos! I couldn’t figure out what the significance of Bewick St. was to me until I looked at a topo map. It’s the location of the old Frisco / MKT interchange back in the days when 8th St. was their yard in Ft. Worth. I’ve got pictures there , not slides, in 1980 of Frisco GP38’s there. I’m getting old. GP38’s are old right? Nice work Ken. Nice grab at an unusual location. It should be interesting to see what the diversion does to the arrival times into Texarkana. Last time it had the 22 running almost an hour earlier than usual.